-Resize the Choose Focus icon to fix transparency issues. -Moved the Choose Focus icon to not cause clipping with regents placement. 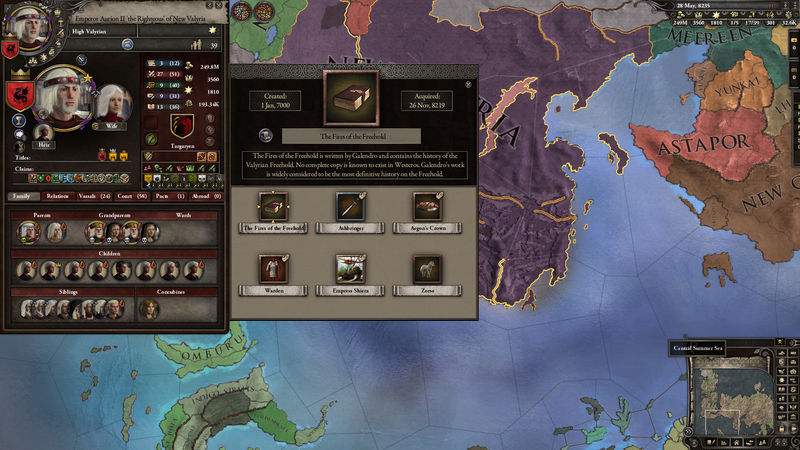 -Dothraki interface fixed along with the nomad icon receiving the custom graphics treatment Credits ngppgn -Gave the Way of life focus icon the custom graphics treatment along with slightly adjusting its position to prevent clipping. -Added some assets for future republic interface update. -Removed the succession interface in favor for the Reaper's Due new succession interface, will return the old interface in the future once I've updated it but for now its too buggy to keep in. -Dothraki and Beyond the Wall Old gods religions will now use their respected COA Frame instead of the one for Followers of the seven. CONSIDER THIS THREAD TEMPORARY. 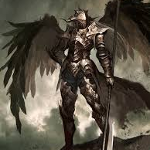 When Genomega returns this thread will be locked so he can have full control of the first post. If you discover any bugs, please report them. I took a little break from the CO update to get this up and running, so it may take me some time to get it fixed mind you! Character finder seems to have some issues. a) Transparency makes the mouseover-text a bit hard to view, since cultures are in white and make the tooltips hard to differentiate. b) The "In Diplo Range" is clipping badly. c) The column headers, especially the icons for intrigue and learning (the one you use to sort characters by intrigue, say) seems to have some extraneous text underneath it, I can't quite make it out. Looks great otherwise, though. Also, it isn't compatible with 'Larger Council Tab' (https://www.tapatalk.com/groups/citadel/sub-mod-larger-council-tab-t6944.html), though LCT is in general compatible with 1.6. Any chance that could be included in this? A) I see what you mean but it's not really too bad luckily. I don't think is too problematic? B and C are both tied together kind of. Diplo Range is clipping yes, and the words underneath the intrigue/learning segments is "Load Filter".So will need to increase the size of the top box... I think I know how to go about fixing it, but will require editing the graphic and then tweaking the interface a little to better work. As for your last question... I'm not really comfortable doing big changes like that to this. For instance this uses the vanilla Societies panel so that when Genomega takes back over he can make the full decision on what to do with it. When he finally returns and takes over, ask him. Sure. I do find it a bit difficult to read, but it isn't a big deal. And no sweat, I had no idea what constitutes a change like that, and this looks nice enough that it is well worth the incompatibility. Cheers. First of all thks for the mod (and also the Congenital Overhaul), great work. It seems that this mod is making my game crash. Every time I m in a war, and more accurately every time i raise my levy/lead my armies. The game goes CTD. Dragon Shift, Dragon Tamer s law, AGOT Music, Seed is strong, Wight Nicknames, Wolflings. Maybe it s conflict, maybe not. 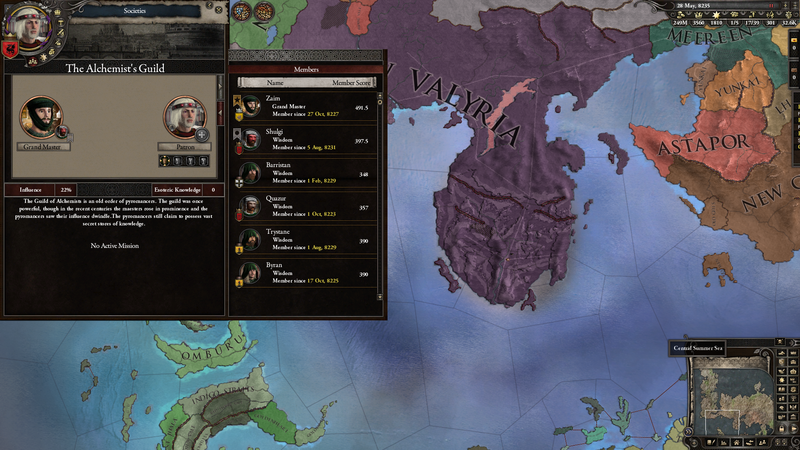 The fact is that when i deselect the interface overhaul mod, go back to my save and then go to war, the game keeps running. It has happened enough to make me consider it an issue and signal it. I hope i m wrong. Unable to duplicate that. 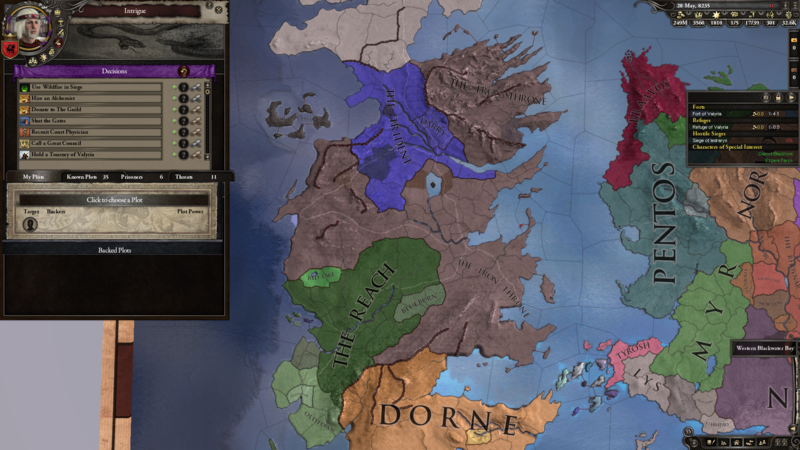 I started a game and declared war, raised levies and attacked somebody with an army led by me just fine. Not sure how this mod could cause that kind of a crash. Everything loads at the start of the game, so if there was a crashing error you wouldn't have been able to even reach that stage... And all other errors would just be missing or misplaced graphics. EDIT: New version (1.6a). Fixed the issue with Character Finder. A couple of things were clipping. Ok my bad then. Thks for checking it. I just advanced a year with this, Congenital Overhaul, Copper and Novus Graphicus active without crashing. So not sure what could cause you to crash. This is only a graphic interface mod. It's not running any scripts or anything. Okay I've discovered 2 bugged things while playing that I'll mention here for reference. One is just a graphical bug, the other causes a game crash that I can repeat consistently which does not happen with this deactivated on the same save. unitpanel.gui << I think if you raise an army and select a leader who already was leading an army.. If you then select the army they were leading this causes the game to crash to desktop. 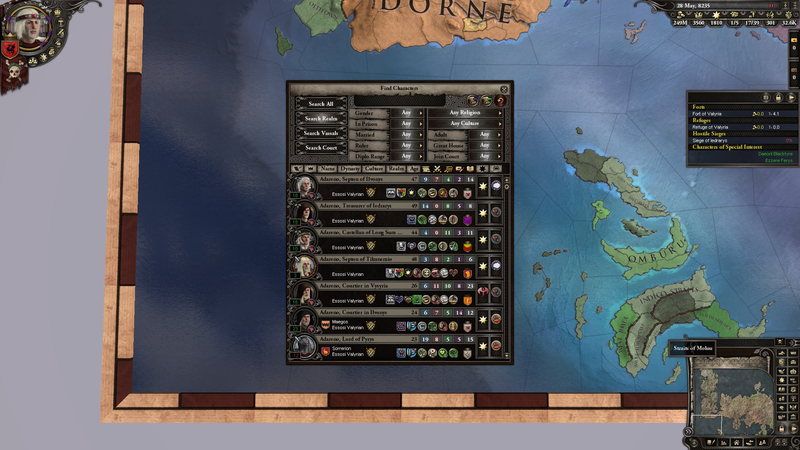 domestic_overview.gui << The "Line of Succession" on the title screen is clipping over top of the vassal/de jure list. If you have between 6-8 titles you can only see the first 5. If you have over 9 titles, the last 3 can't be viewed. I don't have enough time to get this finished, but am working on fixing them all now. This is important also.. YOU CAN STILL PLAY YOUR SAVES. When this is fixed, you can download new version and it WONT EFFECT YOUR SAVES. So there was smtg wrong with the armies. So if i don t want the game to CTD, i just have to leave the army leader as they are until I ve merged the armies ?? New version 1.6LANCELOTb released. Various bug fixes were done. FYI: The crash involving "Armies" was actually not related to armies at all. It was entirely based off of provincial sieges. 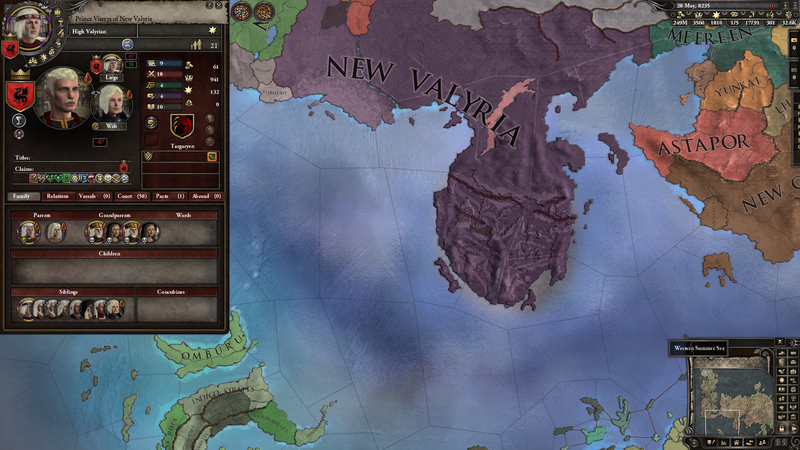 The Fort Level icon was missed in the interface files and that was causing a crash whenever you clicked that province to view it. The Character Finder screen has been updated to look better as well as reveal all options. If there are any bugs blame ngppgn. Not really but he's responsible for the new look (Which looks much better than the original fixing I did).